Have you ever made a crazy, outdoors-related bucket list for yourself? Ever considered actually completing it? Indigo and Caitlin grinning at the PCT finish – mile 2,650 – in Manning Park, CA. The colorful Indigo Catton, University of Pennsylvania grad and Penn Outdoors Club (UPOC) President 2016-2017, is doing just that. Two years ago, I met Indigo on my first Outdoors Club trip. She organized a Sunday morning hike that left campus at 3am to go see the sunrise over Pinnacle Rock off of the Appalachian Trail. I remember while peacefully sitting at a mountain lookout, Indigo offered us her stash of almonds as we all glimpsed the sun’s first rays. It was one of the most random, spontaneous, awesome day trips I’ve been on. I got to know Indigo better on other UPOC trips, and experienced firsthand her open attitude and spirit of adventure. 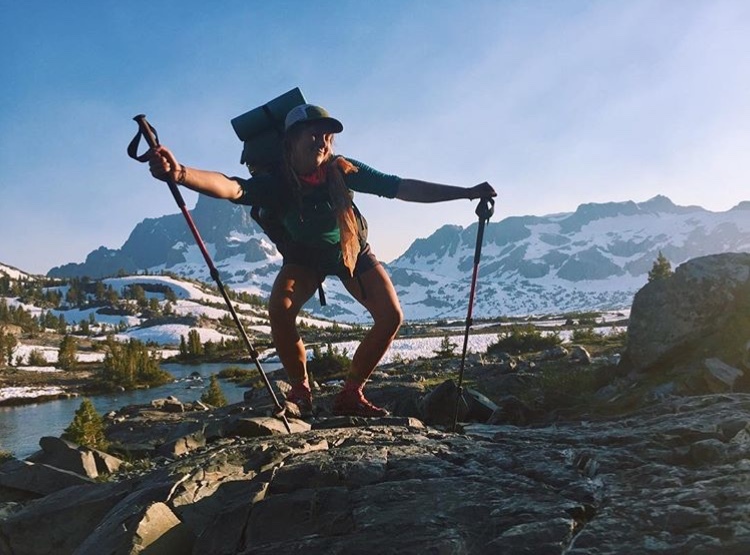 It was no surprise, then, to hear that she was attempting a post-graduation adventure: thru-hiking the Pacific Crest Trail (PCT). 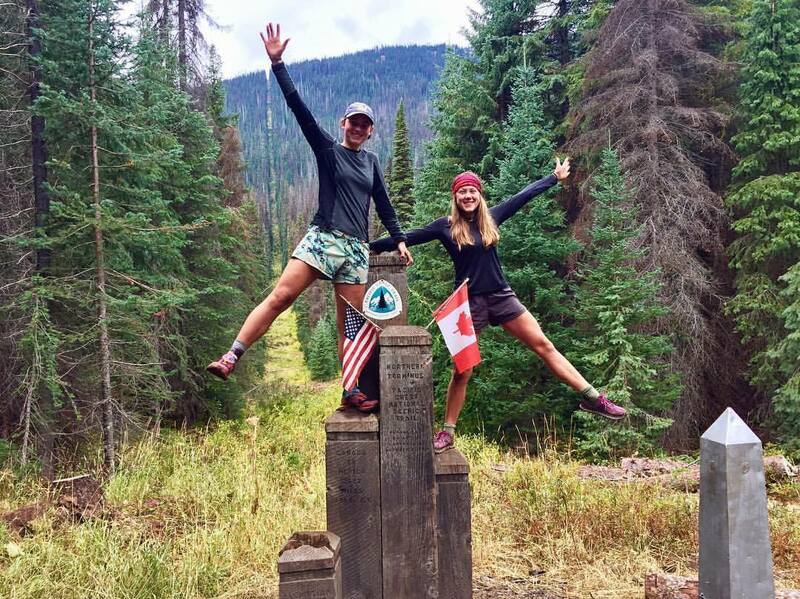 On June 6th, 2017 Indigo and her friend Caitlin Olsen were dropped off in Tehachapi, California, at mile 566 of the PCT. The trail stretches from southernmost California all the way up the West Coast, and ends at the Canadian border in Manning Park. Due to the timing of graduation (don’t you just hate school? ), Caitlin and Indigo weren’t able to start from the southern terminus at the Mexico-California border. Those who begin at mile zero must start hiking in April to feasibly finish before the October cold sets in. So they set their eyes on June. Indigo described their initial drop off in Tehachapi as unimpressive. 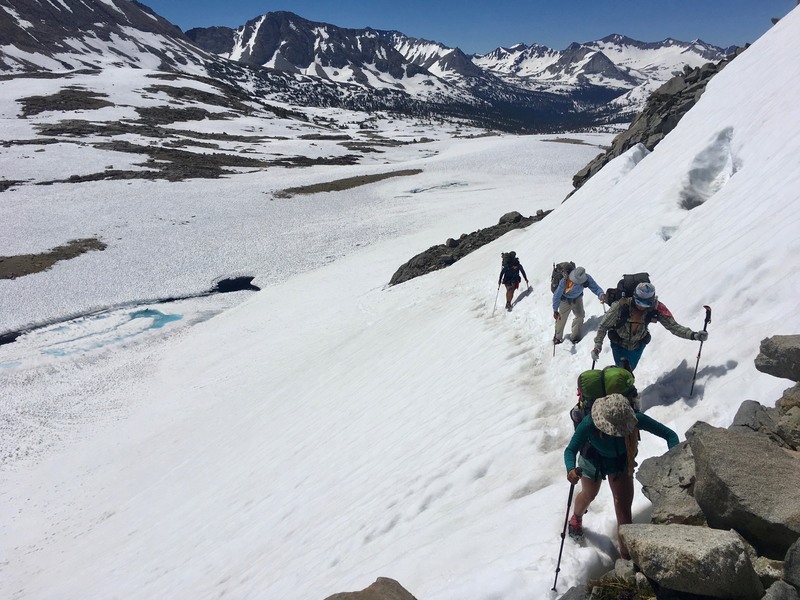 They pulled over to the side of highway 58 carrying “packs that were loaded up with two much food and too much water.” Day one required a hike 18 miles up a 4,000 foot climb in order to reach the first water source before nightfall. It was a pacemaker for the rest of the experience. “I had no idea what I was getting myself into or what lay ahead, all I could do was take it one step, one mile, and one day at a time,” said Indigo. So they picked up their packs and started walking. Rocky ridgeline in the Sierras. So why did she decide to thru-hike in the first place? 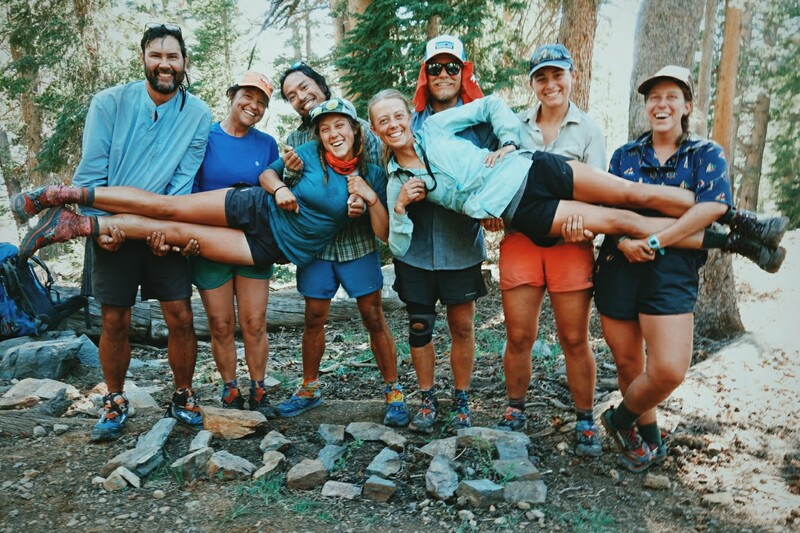 When she was ten years old, Indigo met a group of PCT hikers while on a Girl Scouts camping trip. She and the other scouts were awestruck by the hikers, who appeared to be hiking superheroes. As she grew older, Indigo routinely hiked parts of the PCT recreationally. The trail passes through 6 national parks, 5 state parks, 25 national forests, and some of the most stunning wilderness in the United States. She treasured the time spent outside in these parks. Over the years, her passion for the outdoors grew. In college, Indigo became president of UPOC, got involved in earth science research, and at one point, took her friend Caitlin on her first backpacking trip. Afterward, Caitlin asked if Indigo would consider hiking part of the PCT. Indigo said yes, and the two planned the trip for the summer after graduation. So now for the fun stuff. Indigo and Caitlin embarked on what would become an extremely exhausting, amazing, hard, incredible journey. 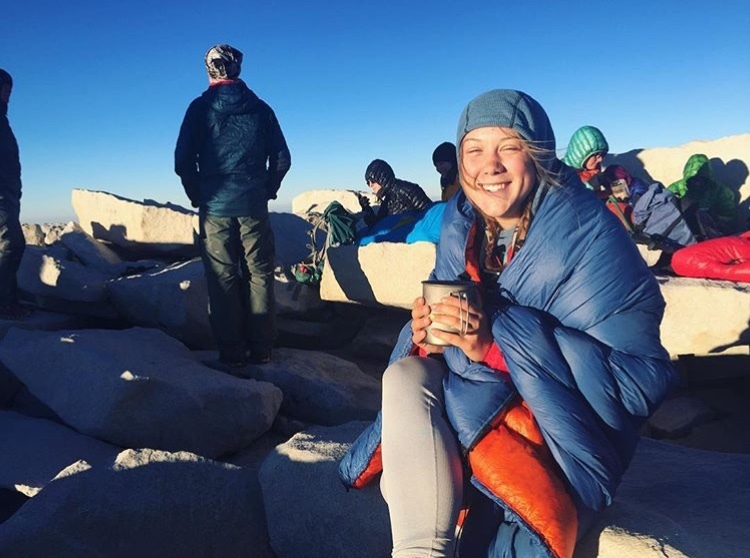 For Indigo, her trail experience began with lots of preparation and coordination – a hard and fast requirement for anyone interested in planning a thru-hike or backpacking trip. What comprises a typical day on trail? It wasn’t hard for Indigo to remember her routine. With repetition, it became deeply ingrained. Nonetheless, she said that each and every hiker has his or her own rhythm. For Indigo, a typical day meant waking up at 5:30am, eating oatmeal in bed, and at 6, beginning to walk. She and Caitlin would hike for 2 or 3 hours before the first snack (although, she admitted, they were pretty much “snacking constantly, all day long”) and/or water break. For Indigo, this break included an energizing, much-needed cup of coffee. Just your typical morning coffee break, Mt. Whitney-version. They took around an hour for lunch, where they would fill up on water. After, they kept walking for the rest of the day, with intermittent breaks every 2 or 3 hours. Around 6pm, they stopped and ate dinner for an hour, then walked until it got dark and exhaustedly hit their pillows. Terrain-permitting, they covered an average of 25 miles per day. Tell me about the food …. The trail diet is one of the quirkiest, most legendary parts of backpacking. “It’s all about the calorie to ounce ratio,” Indigo emphasized. Why? Because you want to carry as little as possible and get the most out of it. She said the goal is to “maximize your dense calories.” She rattled off a few common examples: freeze-dried meals, tortillas, olive oil, beef jerky, dried dates, oatmeal, peanut butter, pasta, even candy. One little girl Caitlin spoke with was wide-eyed with envy when she mentioned they got to eat multiple candy bars a day. However, she added that food, like routine, is a “super personal” choice – you can do it whatever way you want. Indigo preferred sticking with oatmeal for breakfast, and bars and nuts throughout the day as snacks. But she also carried a small Nalgene of olive oil to pour on just about anything. And other people embraced their preferences, too – she told me about one friend who didn’t want to deal with the weight of a cookstove. He consequently ate a packet of cold, instant Idaho mashed potatoes and gummy bears everyday for lunch, which we both concluded sounded like a huge stomach ache. The Sierras. Even the record-setting snowmelt runoff could not compare to the risky mountain terrain. 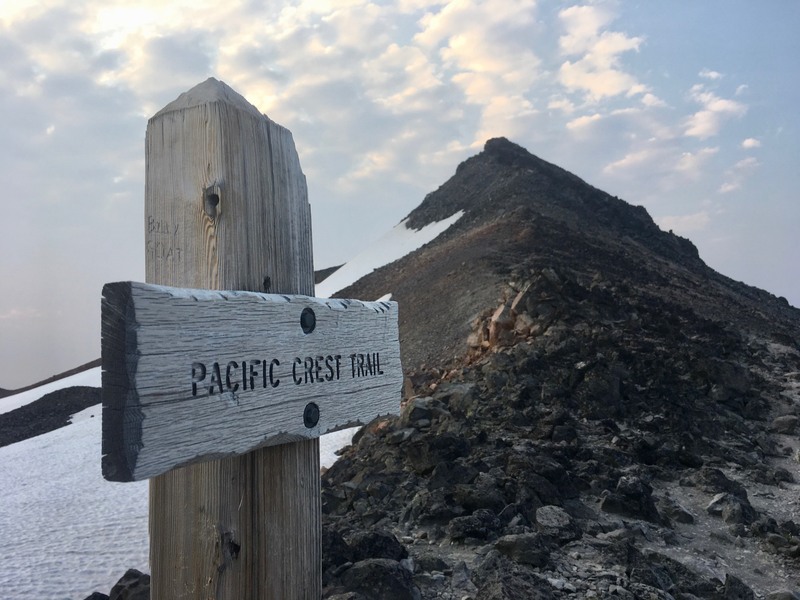 There are five main passes that everybody worries about on the PCT portion through the Sierras, because they remain snow-covered late into the season. Indigo said that Mather Pass was, to her, the longest and most exhausting. Don’t look down on Mather Pass. When attempting these passes, the hiker wears crampons, and carries both an ice axe and a pole for guidance. The rhythmic movement she described was simple: kick, step, kick, step. The catch is that you have to be completely sure of your footing. One wrong move could result in a fall down the mountain. 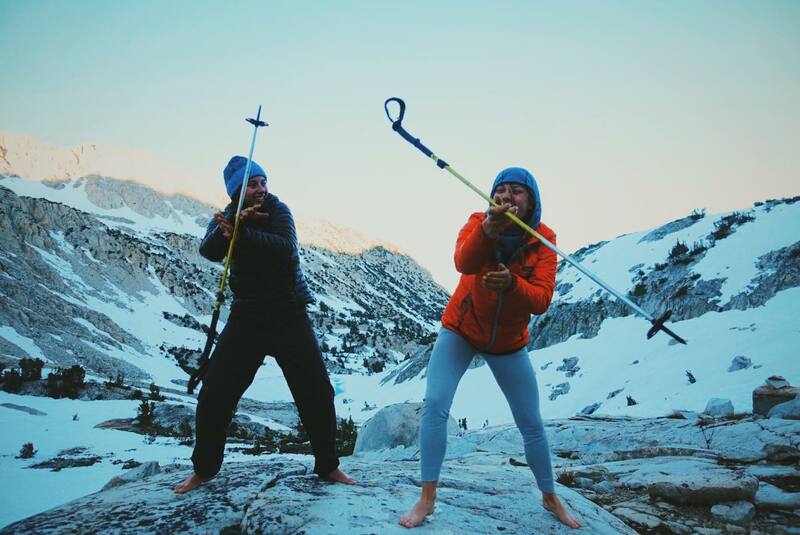 Kung fu with hiking poles ft. the Sierras in the background. Indigo remembers crossing the pass as one long adrenaline rush. “There were moments where you get in the zone, and just have to trust yourself. And moments where you look down and realize if anything happens, you’re done for,” she recalled. After she safely completed Mather, she was both relieved and amazed by what she had accomplished. She laid her poles down in the snow and took a much-needed break. What were river crossings like with the record-setting snowpack? When no convenient spots were in view, they had to confront the current. Once Indigo went first, and, stepping sideways, plunged her foot into an unexpectedly deep spot, losing her balance. She was nearly carried away by the current, but fortunately lunged and grabbed onto debris hanging off the side of the riverbank. Completely soaked, “that night in the tent was miserable. It was really cold,” she said. Later on, they joined a larger group (without whom, Indigo added, they couldn’t have hiked the Sierra portion). The bigger crew used the “I” formation to cross the rivers. This means that the largest people stand at the two ends of a straight line, and all the hikers cross by moving together, stepping sideways across the river. Even with this tactic, it was dangerous, and at times they camped on the riverbank to wait for a morning lull in the current. One happy trail family post-thousand mile marker. Indigo said she “would’ve gotten tired of the scenery quickly if I hadn’t been with such incredible people.” It was her companions that truly brought the trail alive. Who were these memorable companions? Some were family. Indigo’s dad was able to visit her on trail, which was special for both of them. Indigo said he was both surprised and impressed by the enduring grit required by thru-hikers attempting to cross the Sierras. Day hikers, too, warmed her heart, voluntarily giving up their hiking snacks (cookies) to her and her trail family, despite Indigo and friends’ protests. People in the towns they stopped in would surprise Indigo by buying her and her friends beer and eagerly asking for their trail stories. The trail magic was kept alive also by “trail angels” who showed up at random spots with goodies for hikers. Sometimes that meant Indigo and her hiking crew “[came] out of some pass and someone had set up this whole station where they were making eggs and chili,” and they took a break from hiking to sit and relax with them. She said it was always a welcome change in routine. One particularly dreary Sunday in Northern California, Indigo remembers they emerged to trail angels with fresh coffee and donuts for the hikers, and a tail-wagging dog to brighten their day. These experiences comprised what she cherished most on the trail. Hell yeah. Right now, Indigo’s outdoors work is mainly in the lab. She is currently in California conducting research on a tree canopy project. But when I asked if she would consider doing another big hike in future, she said definitely (spoiler alert, she’s got her eyes on the Continental Divide Trail, CDT). Groovin’ out near Thousand Island Lake, CA. What advice would you give aspiring thru-hikers? “If things bring you joy and make you feel relaxed, you should prioritize that,” said Indigo. For her, being on the trail and in the wild “makes me feel like a better person,” so that’s exactly what she does. She extended this to taking every day outdoors initiative, as well. Some of her favorite college memories were spending time in the woods with fellow UPOCers and introducing them to the beauties of the outdoors. Just do it! Indigo met quite a few day-hikers on the trail who regretted not thru-hiking the whole thing. They said they had always wanted to do it, but for one reason or other, hadn’t. Wondering how to start the elaborate process that is a thru-hike? Here are 6 quick steps to get you through the planning process. 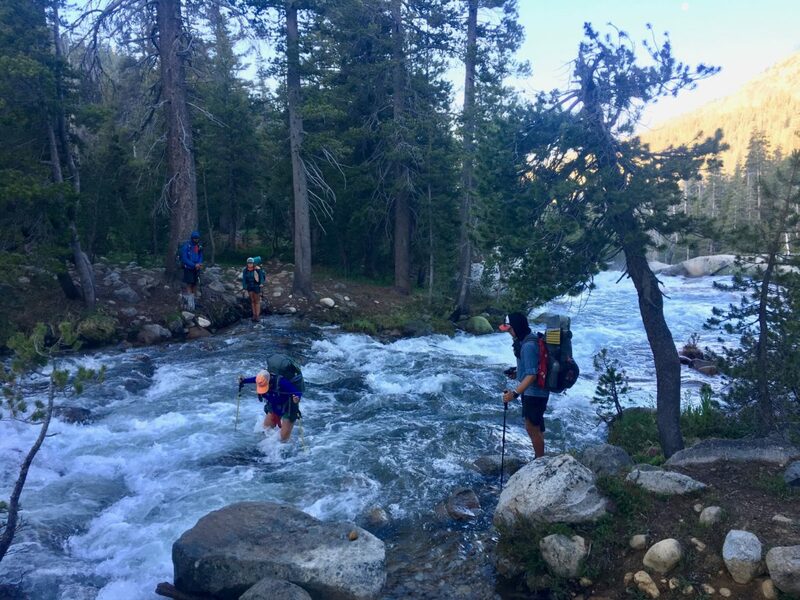 Maybe you’ve always wanted to hike the John Muir Trail (JMT), Long Trail, or the Presidential Traverse, or you’re looking for something longer like the CDT. Choose a trail based on the season, weather, location, and time/resources you have to devote to your hike. Set a date and then apply for permits! 3. Dun dun dun … Now time for the money stuff. Budget out your trip. Make sure you’re physically fit. Start going on long day hikes or overnight trips to get your body ready and test out your gear. 5. Do some mental preparation. Reflect on why you want to hike and what you want to get out of it. The trail will be hard – that’s a guarantee – and there will be times when you want to quit, but in these times, it helps to remember why you started. It doesn’t hurt to have a journal, download podcasts, and make a playlist of your favorite music to keep you going when times get tough. Now for the fun part – start your trek! Plan your transportation to the start, have a hot meal and take a good shower because it will be your last for awhile. Don’t let the nerves freak you out. You can’t possibly prepare for every scenario, but be smart, trust yourself and you’ll be surprised at what you can accomplish. Photos from Caitlin Olson, @mycrazyadventurescalledlife, and Isko Salminen.